If you have ever been a fan of the sunnier side of drum & bass then youll no doubt recognise the name Young Ax. Germanys funkiest export has been turning out feel good music thats packed with fresh feeling and inimitable musicality for over a decade. Working alongside Santorin, the label hes released the majority of his music on, Young Ax launched his own imprint as an outlet for his personal favourite tracks. And for Sugaphonics third release Young Ax has enlisted the help of one of the D&B scenes most loved veterans, Calibre. 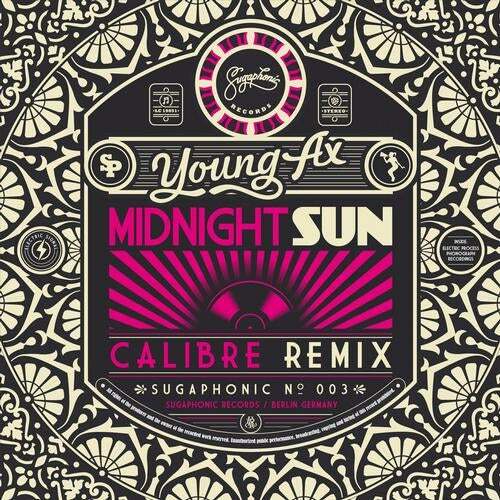 Taking Young Axs 2005 classic Midnight Sun and wrapping it in his own production style, Calibre has created something that every D&B fan will want in their collection. Rolling breakbeats and effortless musicality are blended up with an infectious bassline and all those classic Calibre trademarks that we love so much. Backing that up Young Ax offers Rave Zeit a cunning concoction of enveloping synths and old skool jungle breaks that oozes with fresh ideas. As the musical pressure builds and pulls you in, its not long before Young Ax unleashes the tension and the drop washes over you with perfect bassline pressure. Finally Young Ax offers up a Funkmischung of Midnight Sun with refreshing downtempo results. If Alex Zwingenberger had been born a decade or two earlier this could have been the backing track to a Stevie Wonder classic. An incredible addition to an already stunning package.